Collared Aracari (pteroglossus torquatos). They are medium sized toucans, brightly plumaged and have enormous, contrastingly patterned bills. These birds are residents in forests and woodlands in the Neotropics. The keel-billed toucan (Ramphastos sulfuratus), also known as sulfur-breasted toucan or rainbow-billed toucan, is found from Southern Mexico to Venezuela and Colombia. The toco toucan (Ramphastos toco), also known as the common toucan or toucan, is the largest and probably the best known species in the toucan family. It is found throughout a large part of central and eastern South America. 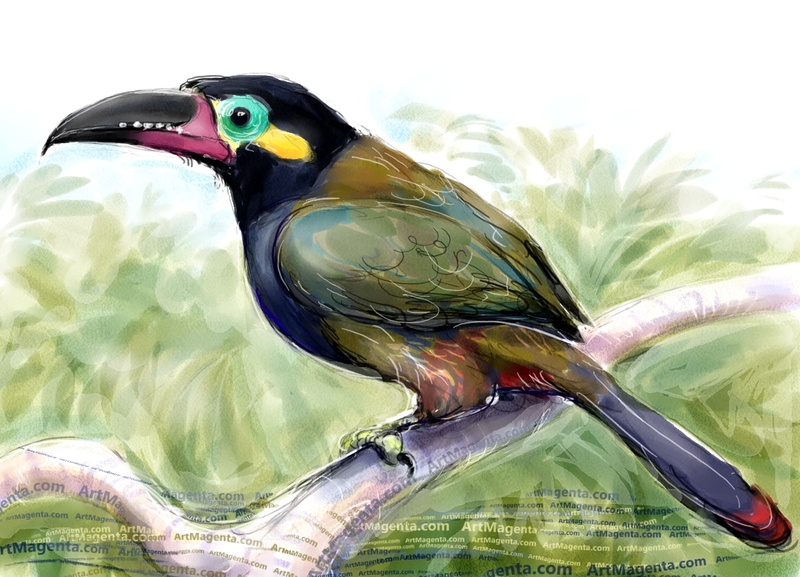 The Guianan toucanet, or Guyana toucanet (Selenidera piperivora) is found in north-western Brazil, French Guiana, Guyana, Suriname, and Venezuela.